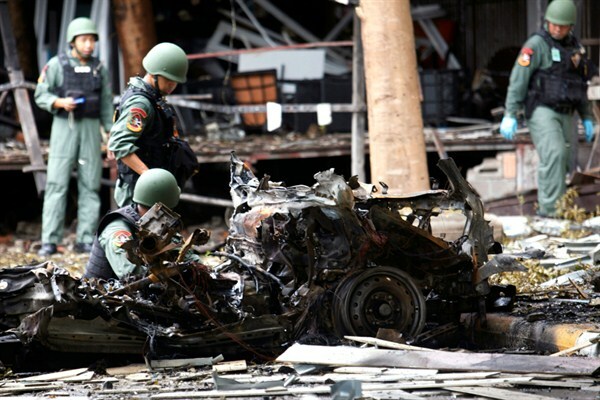 Thai bomb squad officers examine the wreckage of a car after an explosion outside a hotel in Pattani province, southern Thailand, Aug. 24, 2016 (AP photo by Sumeth Panpetch). Amid a recent spate of attacks, and with peace talks floundering, the long-running separatist insurgency in southern Thailand is showing worrying signs of escalation. On May 9, twin explosions at a busy supermarket in the southern province of Pattani injured 61 people, before a roadside bomb planted by militants killed six Thai soldiers in the same province on June 19.